Fits any monitor due to the choice of monitor mounting options; the small universal plate and the lipped plate. 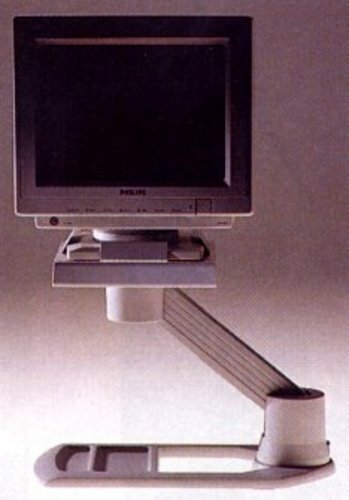 The arm can be mounted in one of three ways; clamping to edge of desk (C clamp), a dual purpose mount (DP clamp) allowing you to use a cable port mounting option where the arm is mounted through the cable ducting hole, or the arm can be bolted through the desktop. Cables from the monitor can be put into the cable ducting within the arm. Available in grey or black. GS-TUV and AFRDI tested. Model Armdec Ergoraiser Monitor Support: Available in a range of colours.